Japan is a glorious place if you love trying new foods. 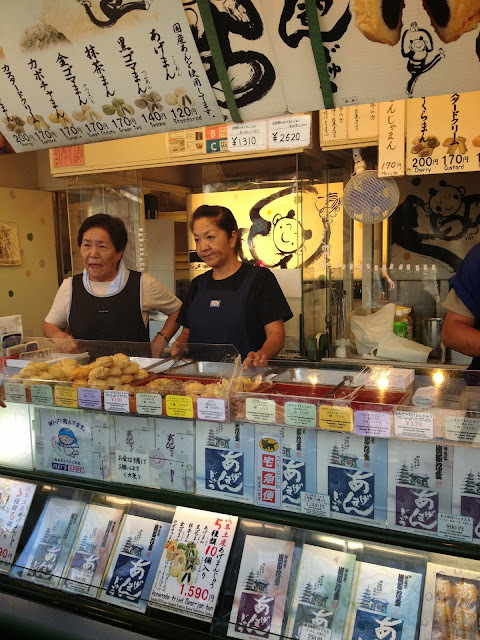 Everywhere you wander in Japan, there always seems to be an abundance of snacks and sweets and meals that will stave your hunger at any time of the day. 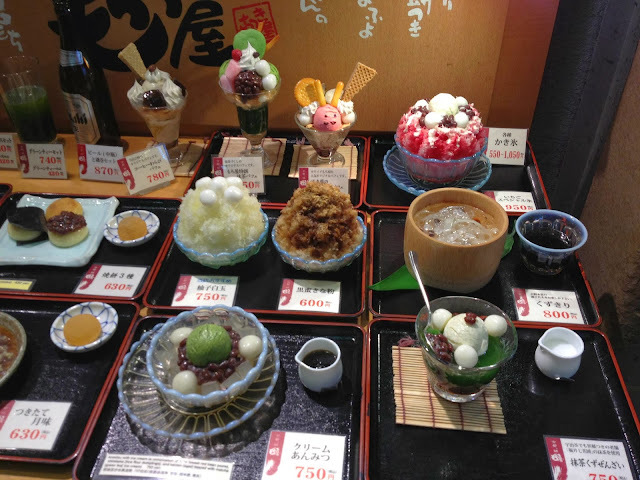 Whether its wagashi, onigiri, bubble tea or ice cream, there was definitely no shortage of delicious Japanese fare on our trip. 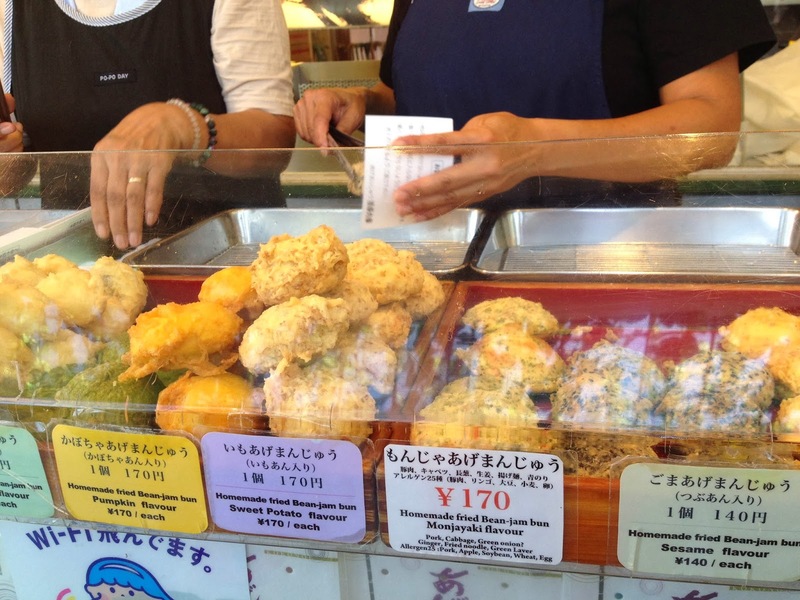 Convenience stores were lined with recently made bento boxes and onigiri, as well as a variety of small snacks that would suffice for a cheap and tasty dinner. It's surprising how different the convenience stores are - some bigger ones, like 7-Eleven, sold soft serves and fried snacks that were cooked in store. What I loved the most about going to the land of Sushi was all the different types of street and snack foods that I was able to sample. Surprisingly enough, the whole time we were there I did not once eat a takeaway sushi roll, despite how common they are here in Sydney. Instead I had a lot of sweet things - soft serves, parfaits, doughnuts...... but strangely enough, very little 'fast food'. I can't pinpoint a favourite street snack, but something I did find was really delicious eating in the 30-plus degree heat was the green tea soft serves. I'd never had these before, but upon first lick (and on the very first day we arrived) I was hooked. It was definitely quite different in terms of taste, something you'd have to get used to if you hadn't had a lot of green-tea flavoured confections before. Sometimes it would be served in a waffle cone, other times a plain kiddie-style cone. Some stalls sold only the green tea and vanilla flavours (often with an option of half and half! ), and others had a wider variety with chocolate, mango, strawberry, black sesame and peach. 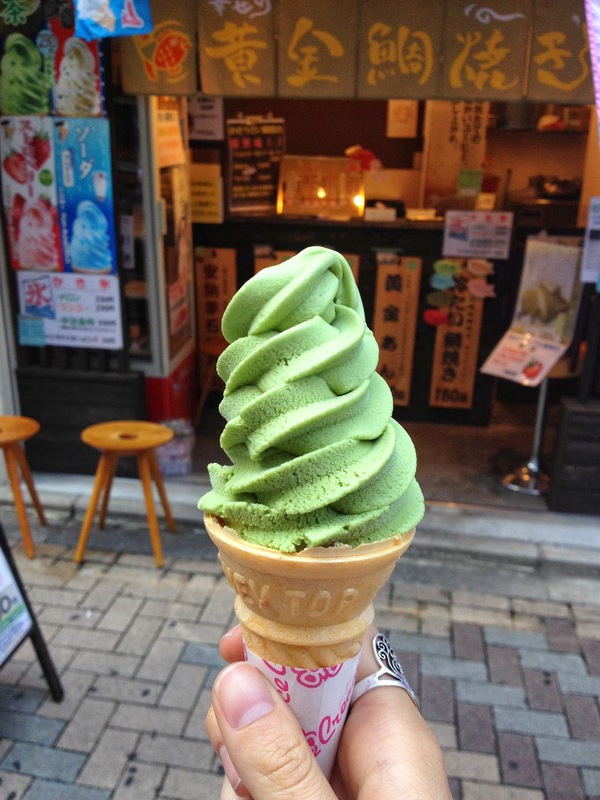 It is the quintessential reflection of the Japanese culture, a fusion of Japanese and Western confectionery - the green tea and the soft serve. 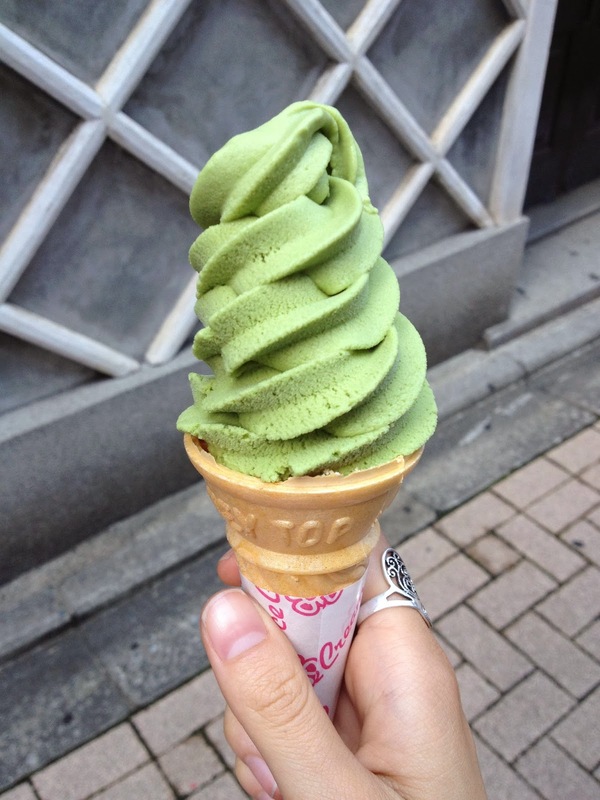 Green tea is the chocolate of Japanese food - by far the most popular flavouring. We saw green tea cakes, green tea mochi, green tea cookies, even green tea Kit Kats! 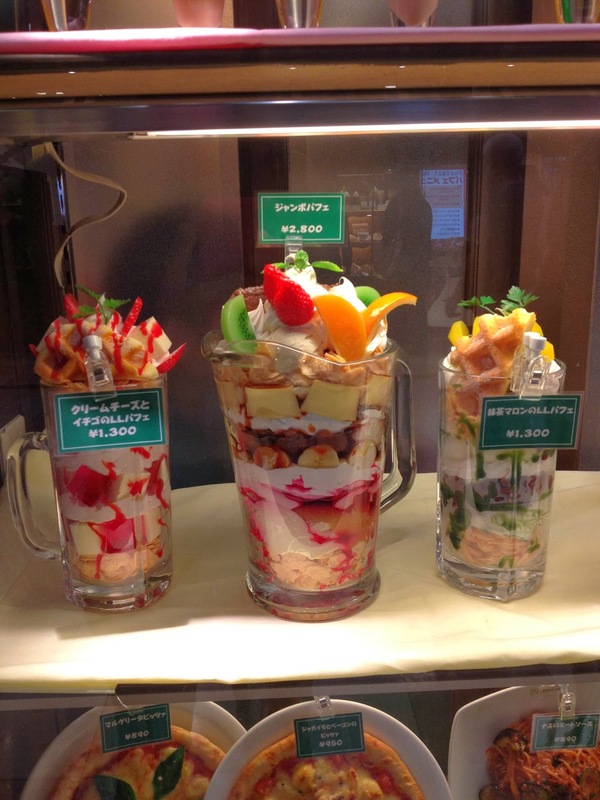 We discovered that if there was one thing the Japanese really love as dessert, it's parfait. 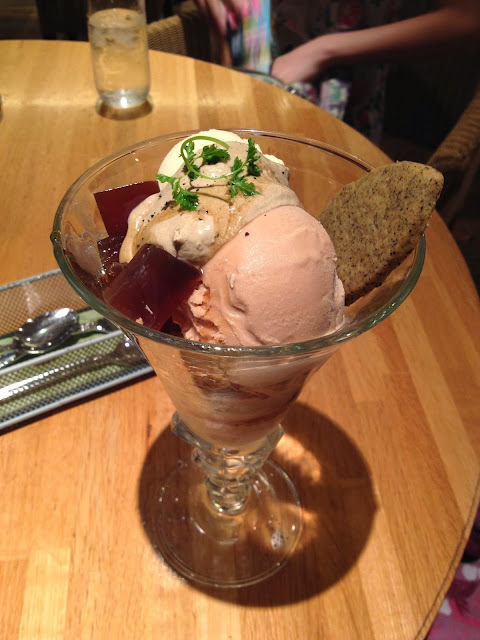 Where a typical parfait loosely resembles a frozen ice-cream, the Japanese parfait is made up of a mix of ice cream, fruit and some other sweet thing - most likely cake or jelly - and is a common menu item in coffee shops. Walking around the arcades of Kyoto and Osaka, we saw an endless amount of restaurants that had parfait models in their shopfront windows, and even eateries that sold parfaits only! Nicknamed 'parfat' (by us) for their high-calorie capacity, the very first one we tried was at the Lipton Tea House, a café and patisserie run by the owners of Lipton (as in the tea variety). Japanese people don't typically share dishes, but we couldn't possibly have one of these each. Served in a tall glass, layers of tea-flavoured cake, jelly and ice cream were piled on top of one another and topped off with a black tea biscuit. The lemon tea parfait was Lipton's house specialty - being a tea house and all - and had a beautiful tea flavour that was truly unique. The tea jelly cubes added a lovely textural layer to the parfait and were delightful paired with the smooth ice cream. Definitely something worth trying. 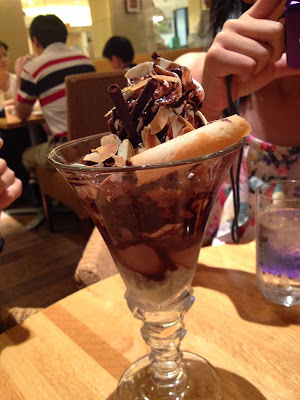 The chocolate parfait has banana and sponge cake with a showering of chocolate curls and cream on top. Early on in Kyoto we stumbled upon a specialty shop called Andrew's Original Eggtart, which was quite small and sold only egg custard tarts. We bought one for less than 300 yen and it was still warm out of the oven. 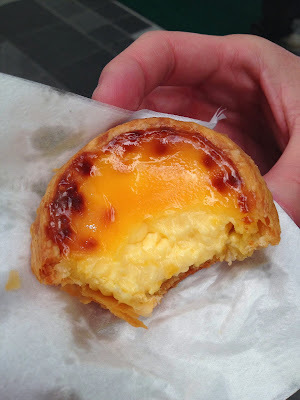 It was a cross between a Portuguese custard tart and Chinese egg tart, with the not-too-sweet eggy filling complemented by a crunchy, flakey pastry that was just like a Portuguese tart (with the caramelised top, too). Something I'd really wanted to try was Taiyaki, a waffle-like, fish-shaped cake filled with red bean paste. 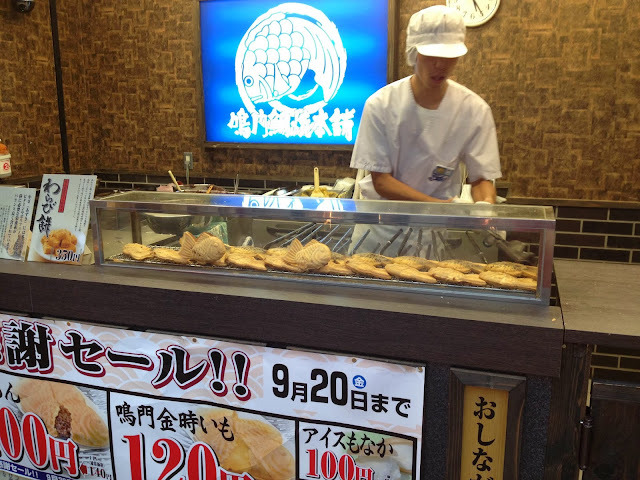 I got my wish when we visited a Taiyaki stall in the Teramachi Arcade in Kyoto, which had men standing behind the counter making them fresh. They're cooked individually in fish-shaped moulds over coals, which makes you appreciate them even more when you eat one. 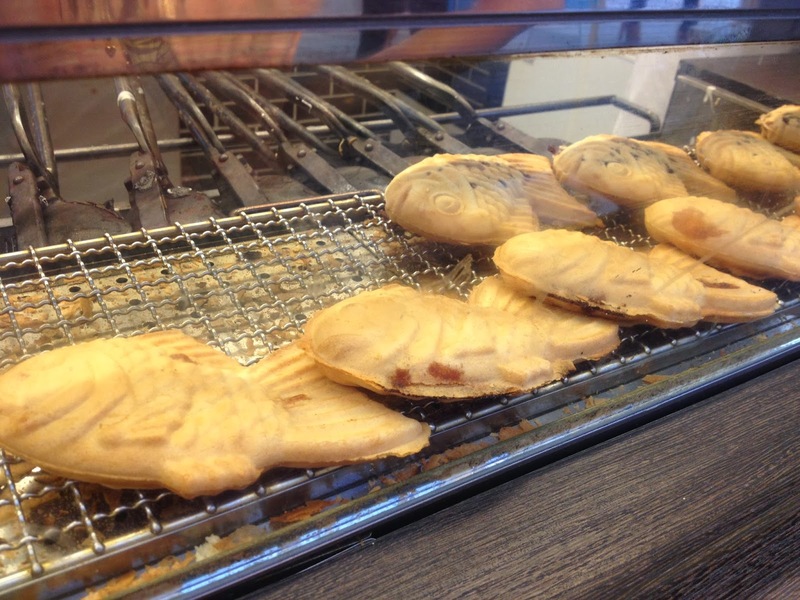 This shop sold Taiyaki filled with red bean and kaya (a spread made of eggs, sugar and coconut milk). The man pours some of the batter into the mould, scrapes a liberal amount of paste from the oversized red-bean-filled bucket on top, pours over some more batter and then closes the mould and places it over the coals. He does this at such a fast pace that there must be least 25 or more cooking at one time. Although it seemed as it there were no line, it turns out the cluster of people standing to 'watch' the man making them were actually waiting for their fresh Taiyaki to take home. And they don't usually just buy one, they buy many. 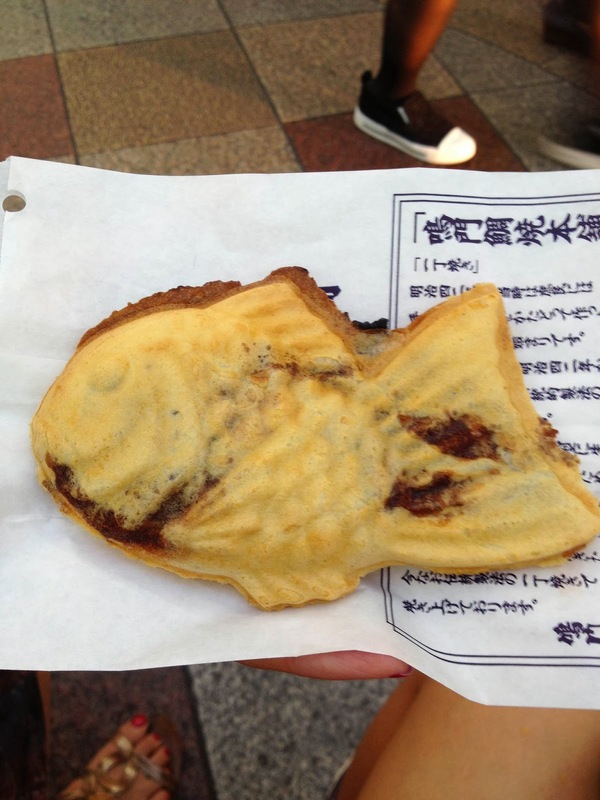 The Taikyaki, with it's cute fishy shape, was surprisingly filling. The waffle-filling ratio meant that the red bean paste made up the bulk of the fish, with the batter layer quite thin and crispy. 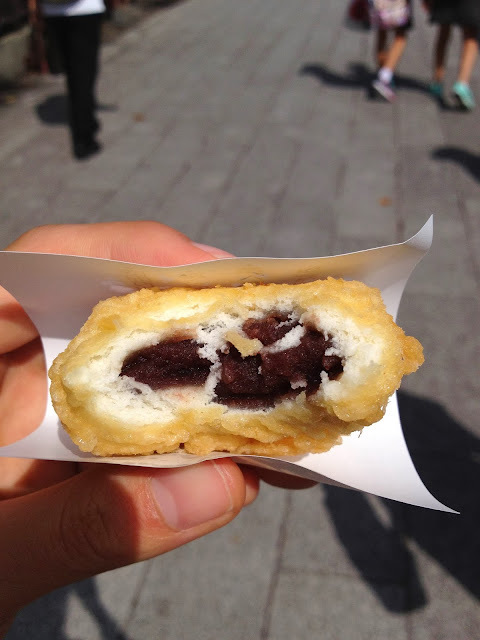 It was piping hot, right out of the mould, and was delightful to eat as the red bean paste wasn't too sweet. 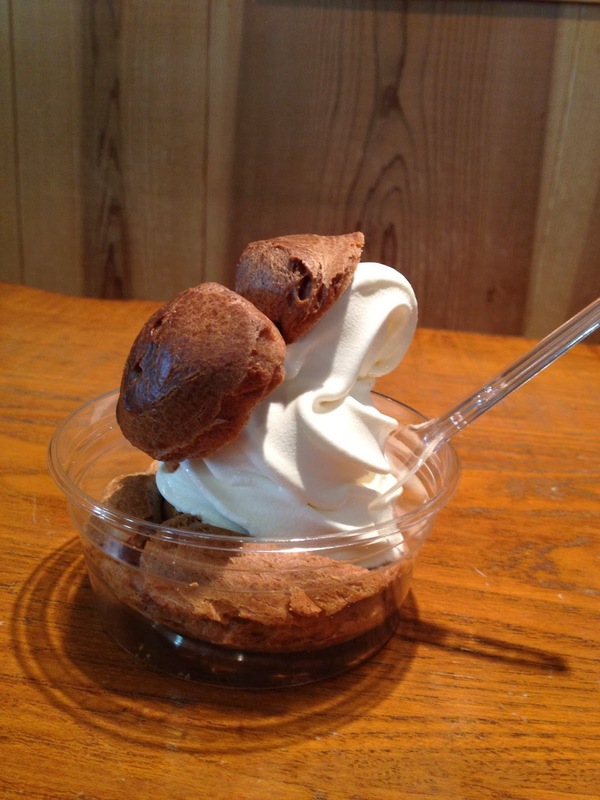 Another ice-cream type dessert/street food we tried was cream puff, in one of the tourist streets leading up to the Kiyomizu Temple in Kyoto. 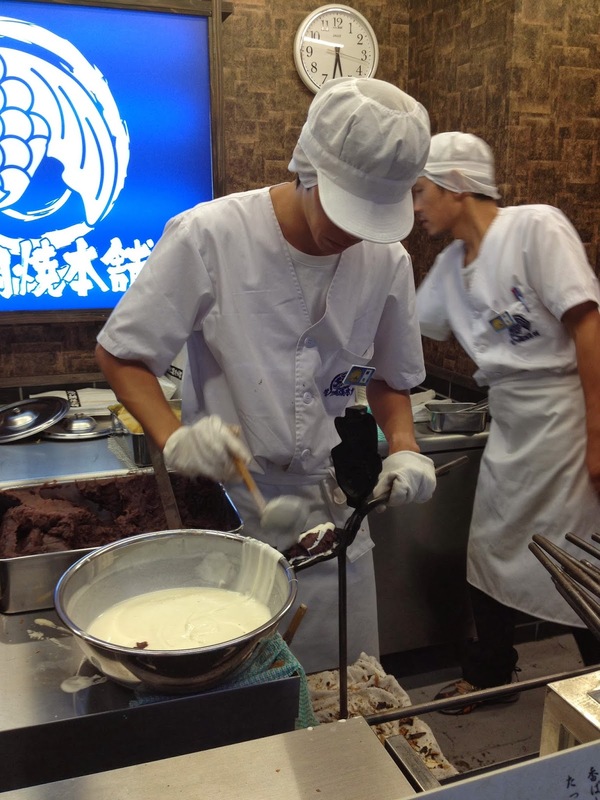 The shop sold cream puffs and ice cream puffs, which could be filled with vanilla, green tea, custard or chestnut cream or ice cream. We tried the vanilla cream puff, it's lid carved off to sit atop a swirl of vanilla soft serve. 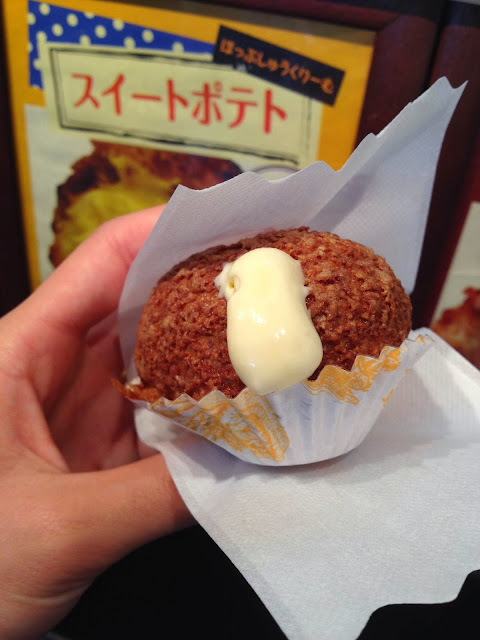 This custard cream puff I had in Osaka, from a cream puff and soft cream shop in the Arcade near Namba Station. Because it was the end of the night, the puff had gone a bit hard and not so crunchy, and it was absolutely bursting with a lovely vanilla cream that was impossible to not get everywhere. It went on my nose, around my mouth, on my hands.... A cute dessert that overflowed upon being eaten. In the world of fried food, nothing says fried sweetness quite like a doughnut. I'm not quite sure what this was called exactly, but it resembled a Japanese doughnut - a fried dough ball with a sweet paste middle. We tried these in Asakusa, in the row of stalls and tourist shops leading up to the Sensoji Temple in Tokyo. For as little as a couple hundred yen, you could buy a cute, fried morsel that was bursting with a filling of your choice. 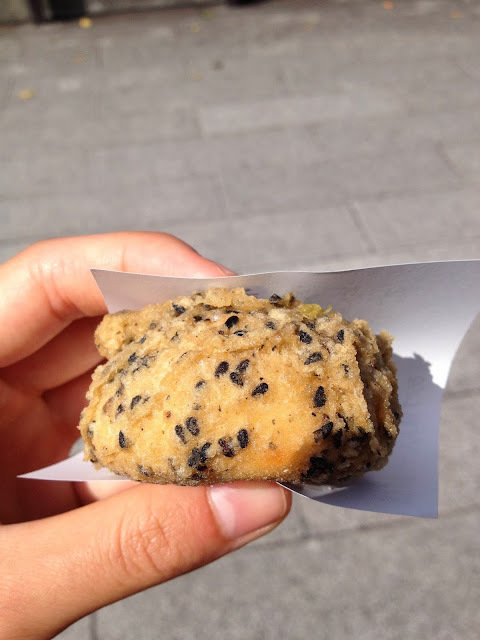 Among the typical 'classic' red bean bun were flavours such as pumpkin, black sesame, sweet potato, green tea, cherry and custard. 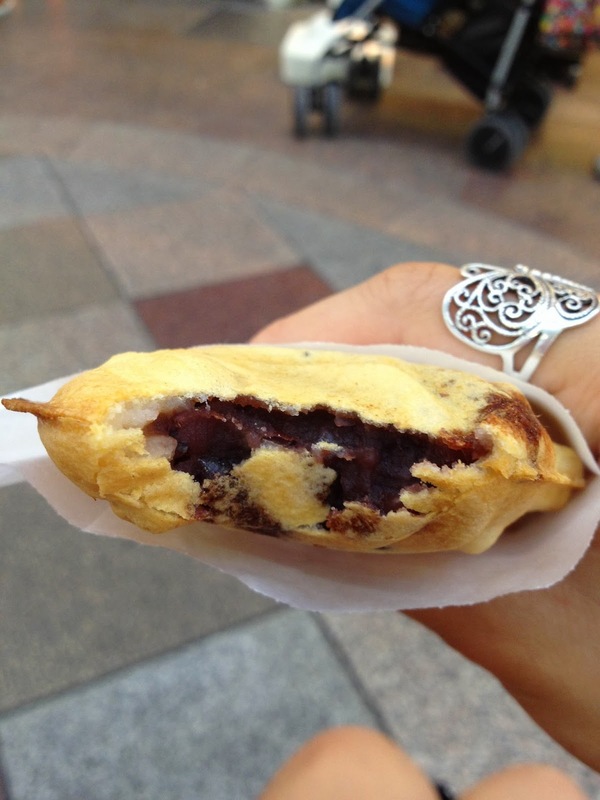 The standard bun was an excellent mid-morning snack, the lightly fried outer encasing the same standard red bean filling. Much like a cross between a fried Chinese jin-deui and a doughnut, but not quite as oily. We also tried the green tea bun, which consisted of a matcha-green dough wrapped around a gooey green tea-flavoured paste. Speaking of doughnuts, we saw a couple of old-style 'doughnut' shops dotted around the mall arcades of Japan as well, their tinkering sounds filling the street and drawing our curiosities. Clink, clink, clink was the noise you'd hear as you approached the shop, where you'd see an aged mechanical contraption filling and rotating and pressing the doughnuts conveyor-belt style. 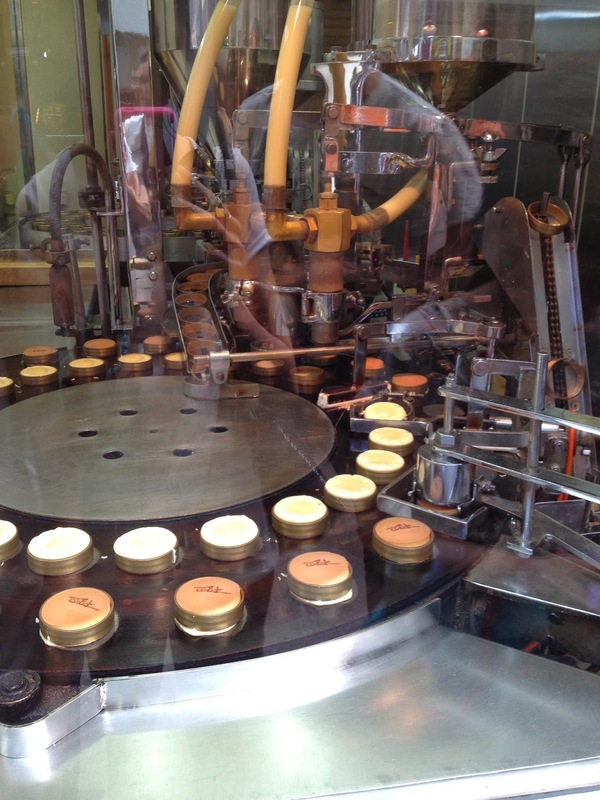 These long-standing machines were so interesting to watch, just like a mini-confectionary factory in the shop window. They resembled the machine that makes the famed Cream Puffs at Emperor's Garden in Sydney's Chinatown. These doughnuts were more cakey than fried (perhaps they were really just griddled cakes), and though we didn't try them they did look absolutely special. 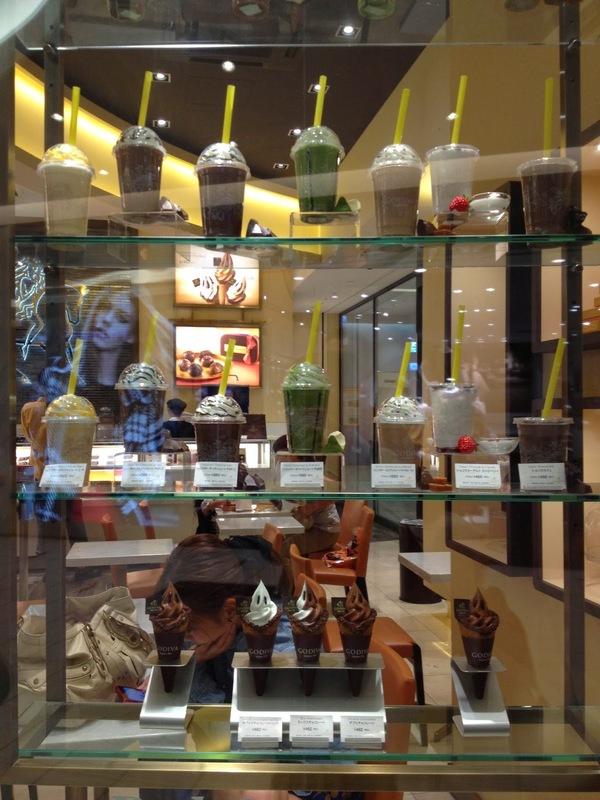 On a final note, the most 'contemporary' sweet we tried and loved during our trip was at Godiva, a Belgium-founded international Chocolatier that sells gourmet chocolates and iced drinks. 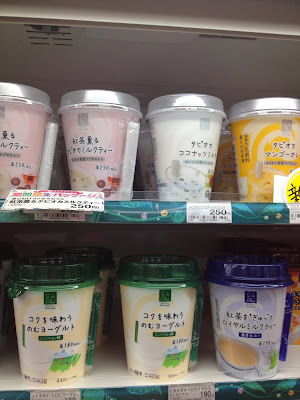 The particular branch that we went to was in Odaiba, a seaside suburb of Tokyo, and it happened to be one of the only ones in Japan that sold their special soft (ice) cream. 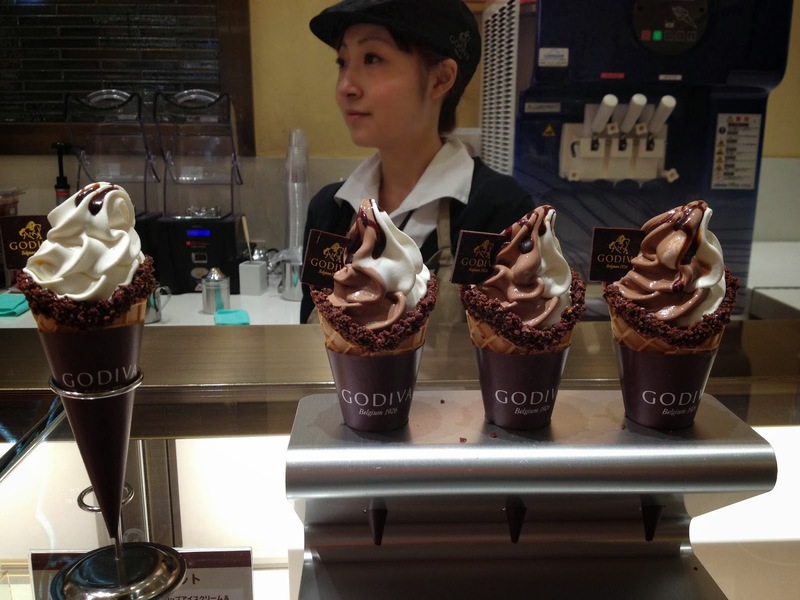 The flavours comprised of either premium chocolate, vanilla or a chocolate and vanilla twist, and for about $5 it was served to you in a chocolate encrusted waffle cone with a special little chocolate Godiva square wedged on top. Oh my goodness. How delectable do they look? I had the vanilla one, and CK, GG and Dad got a combo milk and vanilla soft cream each. 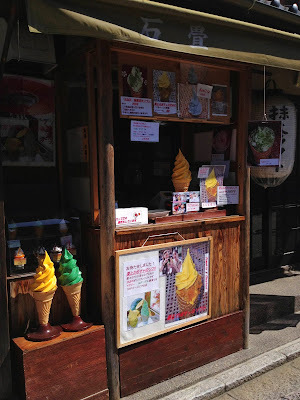 It was truly the best (and most gourmet) soft serve I'd ever had the pleasure of eating. I savoured every smooth, creamy lick. The vanilla soft cream wasn't the diluted, milky ice cream that you'd get at McDonalds, but with a really silky, vanilla taste. The chocolate cream was just divine, with a real, pure chocolate flavour. 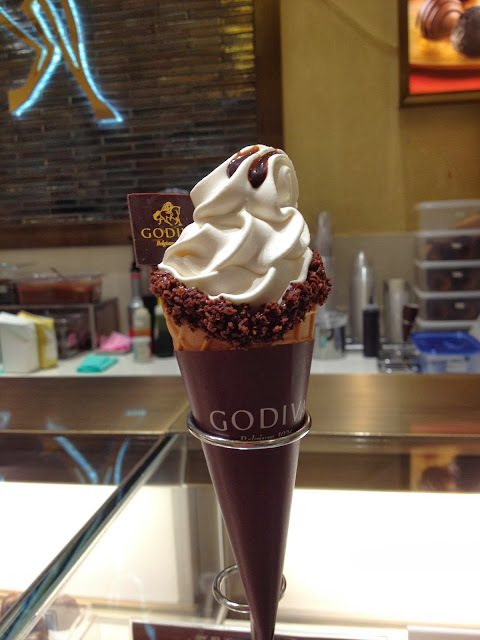 And the choc-crusted cone....so good. 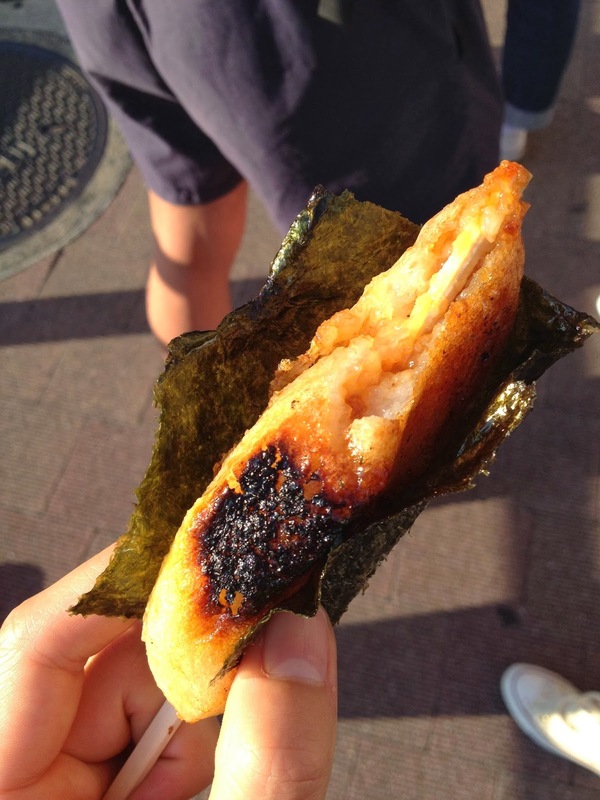 There weren't many street foods I tried whilst in Japan, but one I found really interesting and different was a grilled glutinous rice stick on the street of Gion, Kyoto, which came wrapped in a sheet of seaweed. The rice was compressed onto the skewer like a meatball (that is, in one large piece), and had a sweet, salty caramelised flavour that went nicely with the saltiness and crunch of the seaweed. It was very glutinous and sticky as well, which was all part of the street food experience. Japan is home to so many wonderfully unique street and sweet foods, with a much wider variety than what you'd find in Australia. All the sweets are far less sweet - probably much better for you than lollies and chocolate - and the food you find on the street and in convenience stores is just as good as anything you'd get in a café or restaurant. That's why I find Japanese food so special, because it's something I never get to experience at home. Stay tuned for more Japanese food! Yes, I'd say Japan would be the perfect place for any food lover - it'd be highly unlikely you'll ever encounter any food you didn't like. Everything is delicious! !